(Happy last day shopping everyone. I’m checking my list and checking it twice. I did almost 100% of shopping online and now just waiting for things to start rolling in. I love ordering, it’s like Christmas everyday when packages start rolling in. I always wish I got an earlier start though because I start getting nervous if I know we are leaving and everything hasn’t made it to my door step.) MERRY CHRISTMAS! 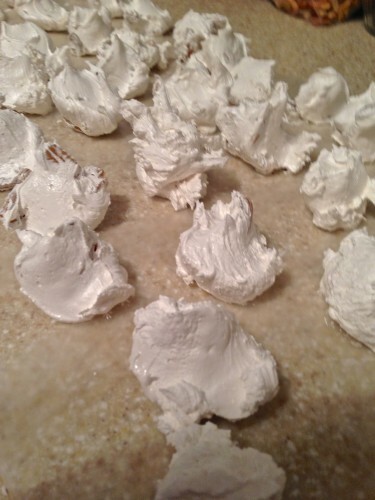 I think anyone who has eaten my mother-in-law’s divinity would call these little pieces of candy “pillows from heaven”. 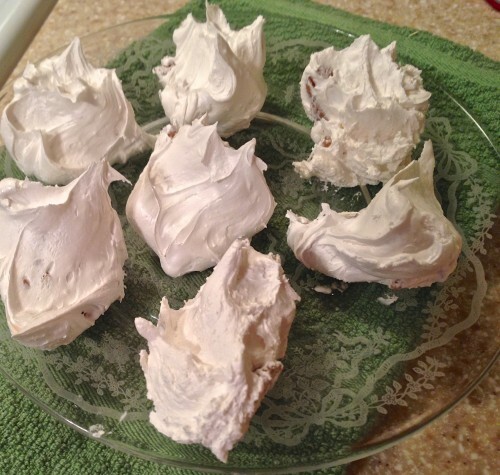 I would wager to say she has been making divinity for at least 50 years probably longer and what amazes me is she makes the most wonderful divinity and never uses a candy thermometer. On a recent trip back to Missouri I talked her into showing me how she does her divinity. I think just about everyone in our hometown probably has tried her divinity and hers is always the first one to sell out at any bake sale. 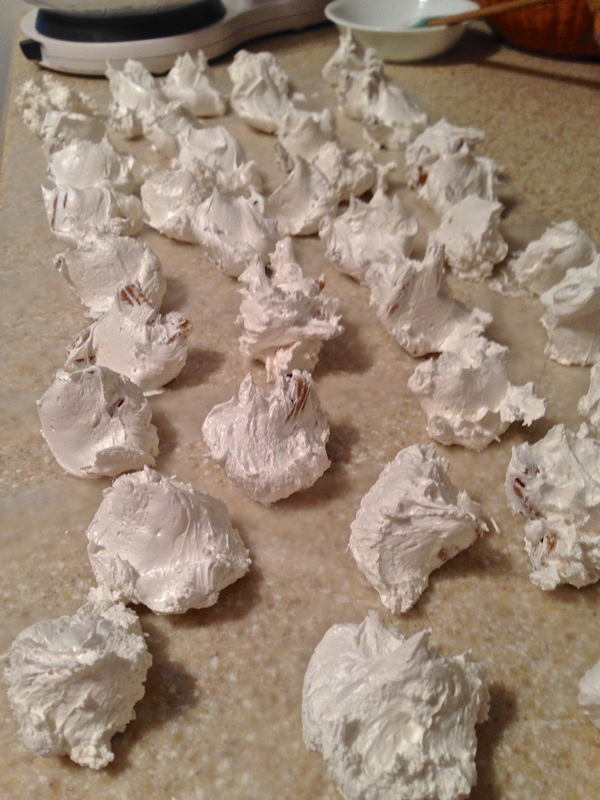 I remember a life time ago, making some divinity to send to my husband at college. You know how roommates and fraternity brothers can be, of course someone stole some of his divinity. To his misfortune he got a piece that had a pecan shell in it and he broke a tooth. Needless to say, he never took any of my husbands food again. This is one candy that everyone in our family knows “Mema” will be making during the holidays and Mema’s is so much better than anything I could every make. Do you have a favorite candy or sweet memory from the holidays? If so, leave a comment below to share. Only ingredient missing from this picture is the Karo syrup. How simple is this list of ingredients! 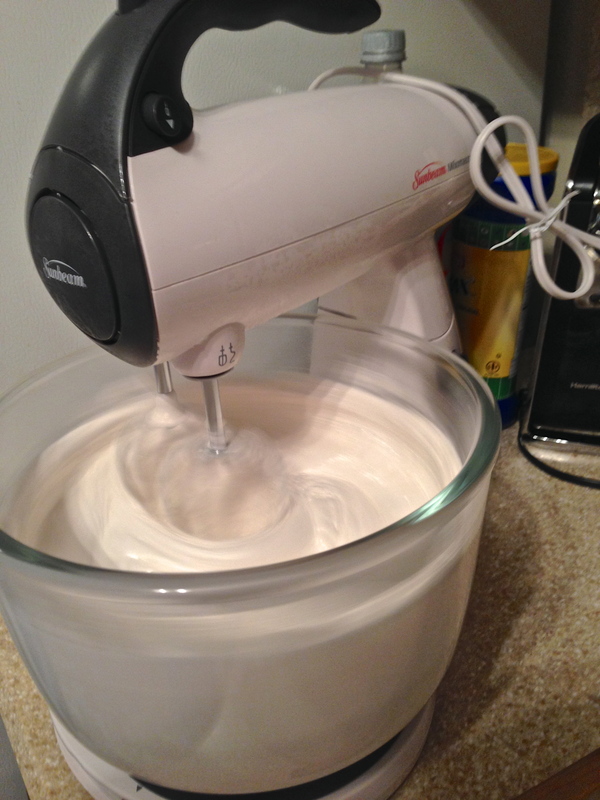 Let the three egg whites come to room temperature. 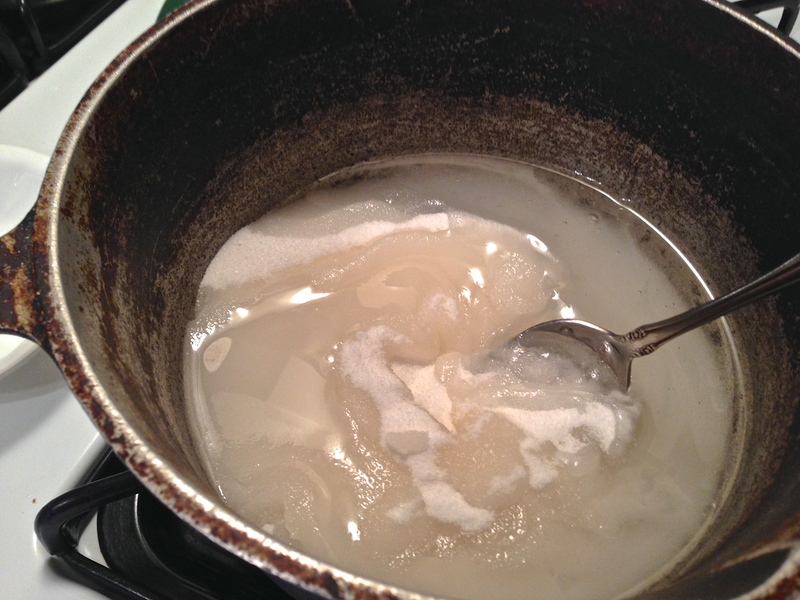 The sugar, corn syrup and water goes into a pan and must be cooked slowly until it reaches a soft ball stage. This is her divinity pan. Looks like it has made divinity many times over the years. This is the soft ball stage. 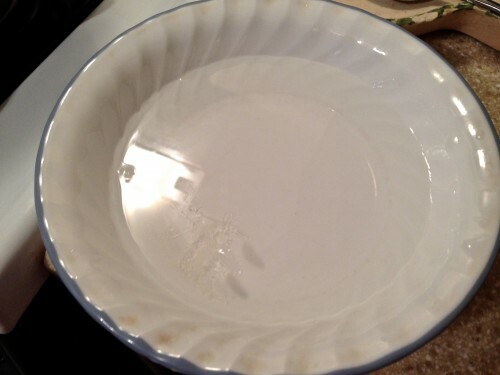 Have a bowl of cold water and after the sugar mixture has cooked for 6-7 minutes start testing it (or use a candy thermometer and cook to soft ball stage). To test it, drop a small spoon full into the cold water. If you can take your fingers and form the mixture into a soft ball then it is ready. 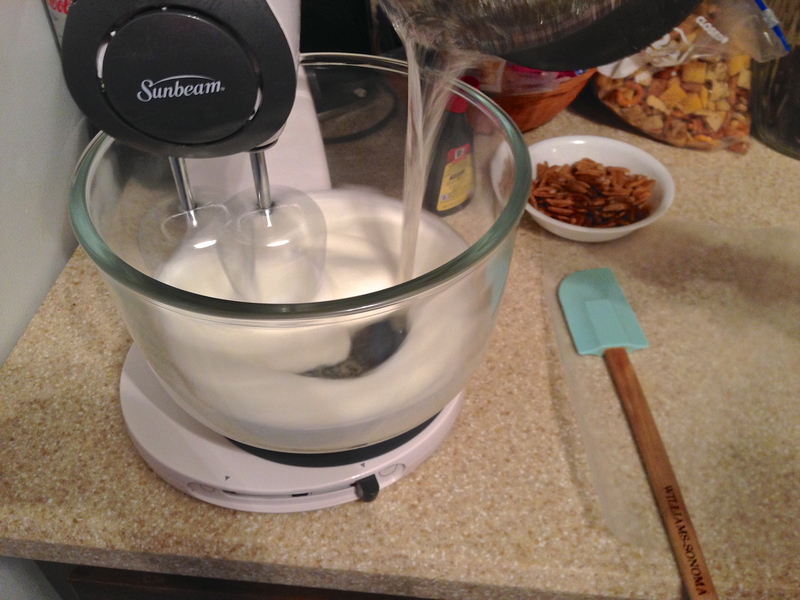 Pour about half of the hot mixture into your egg whites that have been beaten to a soft peak. 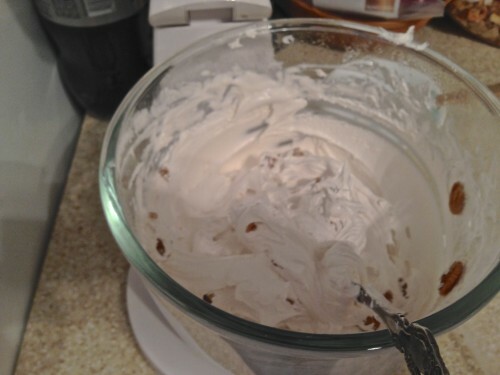 Slowly pour the mixture into the mixing bowl and it will start doubling in size. Now this is the part that takes experience; knowing when to start taking it up. Stir in the chopped pecans and mix until it is ready to take up. That sounds pretty vaque but if you take it up too soon it will puddle on the wax paper if you wait too long it will be stiff and dry looking. You want a smooth, glossy piece of divinity. The ones in the front are perfect where the ones in the back started to get a little stiff. They both taste the same though so don’t worry if your’s don’t come out perfect. My mother-in-law makes the best divinity you have ever put in your mouth. Soft, and nutty. 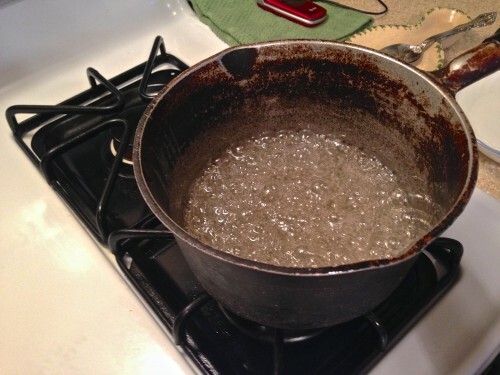 Put the corn syrup and the water into a heavy sauce pan and start heating it slowly until it starts to bubble. While you are doing this, start beating your egg whites until they are almost to soft peak stage. You want to get the syrup mixture up to a soft ball stage. You can do this either of two ways. One is check your candy therometer (235°) or you can drop a tiny bit into a bowl of cold water. If you can take it and form it into a ball with your fingers then you are ready. Just before your mixture gets to the soft ball stage, finish beating your egg whites until they form somewhat stiff peaks. Stop the mixture into your sugar has gotten to the soft ball stage and when it does reach this stage, start your mixer and slowly pour half of the hot mixture into the beaten egg whites (very slowly). Put the pan back on the burner and continue cooking the remaining sugar mixture to a hard crack stage (300-310°) OR take another bowl of cold water, and dribble a tiny bit of the sugar mixture into the water. If you hear a crack then you know it’s at the hard crack stage. 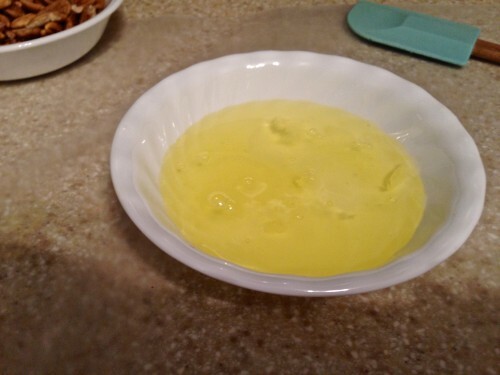 Remove from heat and slowly pour this into the egg white bowl. Continue beating for a few minutes. 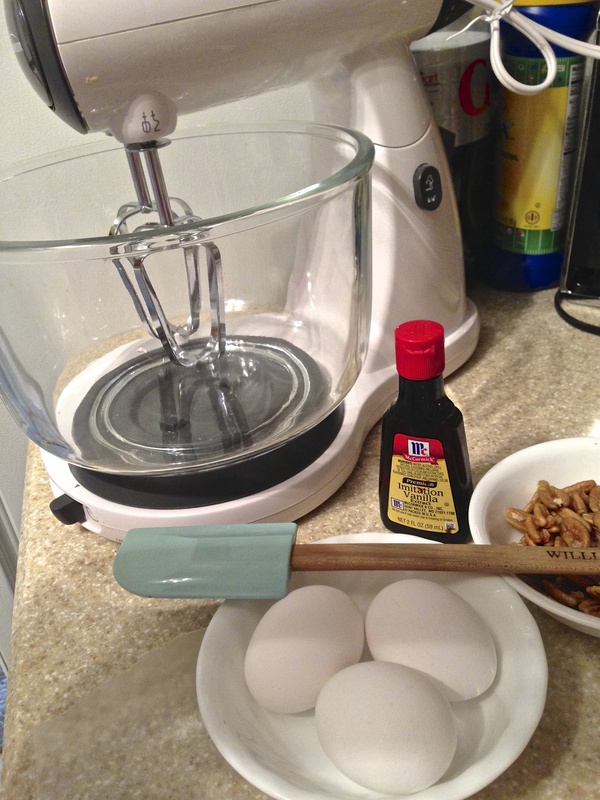 Add in your pecans and the vanilla extract. The hard part is knowing when to start taking up the divinity. That’s the part I usually wait too long. You want a smooth divinity and if you wait too long then it will start to stiffen up on you. My mother-in-law also says if it starts getting too thick you can add a few drops of water to the mixture. Take up the candy onto waxed paper. Let set until firm. Whether you get it out early enough or too late as I do sometimes, it still taste the same and is delicious.